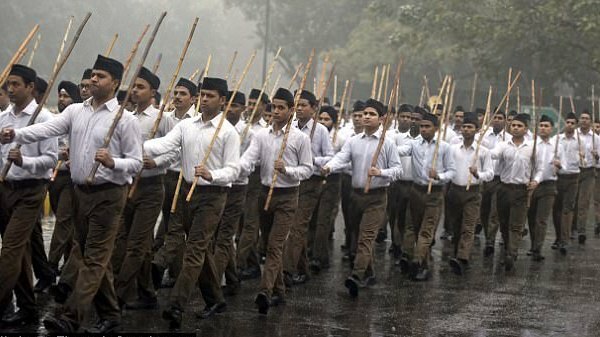 The RSS march: Through the streets of Malda which has a high Muslim population. In its bid to expand its sphere of influence, the Rashtriya Swayamsevak Sangh (RSS) -- the ideological parent of the Bharatiya Janata Party (BJP) that rules at the Centre -- has zeroed in on West Bengal as its next big target, contending the situation in the state is "unprecedented". The RSS is focussing on increasing its strength and presence in West Bengal in a bid to “combat rising radicalism and fundamentalism” in the eastern state that, according to a top functionary of the local unit or the organisation, poses “a major threat to the nation’s security”. “The RSS generally focuses on places that pose a major threat to the nation. The situation in Bengal is very much similar. The radical forces, Maoists and other separatist powers have combined with the state’s ruling (Trinamool Congress) party to work together. “The situation is unprecedented. This nexus of jihadis and radicals in Bengal is a major threat to the nation’s security,” the RSS’ South Bengal General Secretary Jishnu Basu said. The RSS, in fact, adopted a resolution at its National Council meet in Coimbatore last month over the “alarming” situation in West Bengal, and blamed the Mamata Banerjee government for the rise of jihadi elements and the “decline” of the Hindu population. The BJP, the political arm of the Sangh Parivar, is led in the state by a veteran RSS hand, Dilip Ghosh. “Over the past one year, the Muslim fundamentalists and the so-called ultra-left organisations have held several collaborative programmes. RSS vows to fight against those threats and make people aware of the impending risks,” Basu said. He claimed the organisation’s efforts to reach out to the masses has helped erase the “wrong image” about the RSS in West Bengal that was ruled for 34 years by a communist-led government, adding that the RSS’ active members in the state had doubled over the last four years. “We reached out to people from all sections of society, starting from villagers to urban intellectuals, and helped them realise what RSS stands for. There have been years of false propaganda against the organisation,” he said. Accusing the state government of favouring a “certain community” to get their votes, Basu claimed the state’s ruling party is responsible for the rise of Muslim fundamentalism and an “attack” on the Hindus in the state “that threatens to change the demography of some border districts”. “The state government is also fuelling these issues to satisfy a certain community. Looking at the vote bank, the government is supporting the most popular fundamentalists. The ruling party is constantly trying to appease a certain section of society while the troubles of the other half are unattended. “As a result, the demography of certain border districts of West Bengal like North Dinajpur, Malda and Murshidabad is changing,” he contended. Basu said the RSS considers Hinduism as a “way of life” and would primarily focus on saving common people from the increasing attack on radical Islamic forces. “For the RSS, Hinduism is not just a religion, it is a way of life. We consider Hinduism as synonymous with nationalism. In our view, people like (poet) Kazi Nazrul Islam and (late president) A.P.J. Abdul Kalam were major supporters of Hinduism. We will keep pursuing that brand of Hinduism in the state,” he said. Terming cow slaughter a “non-religious” issue, the RSS activist claimed the state has many illegal slaughterhouses that run under the nose of the state administration but no action is taken against them. “The proper guidelines should be followed to run slaughterhouses in the state. I challenge the Kolkata Municipal Corporation to show what guidelines they have for running the slaughter-houses. “I am sure they have none. They have taken no steps to abide by the laws related to the slaughter-houses,” he added. However, according to political analyst Udayan Bandyopadhyay, the rise of RSS in Bengal wouldn’t have any major implications in the long run. “RSS is a socio-cultural organisation. It doesn’t have a direct political linkage or baggage. Yes, the percentage of BJP’s votes may increase, but in the long run it will have to prove its own strength,” Bandyopadhyay said. He felt the RSS might grow and have some impact on social life, “but it won’t create any trouble as Bengalis are largely tolerant”. He said the RSS had its presence in Bengal at the time of partition in 1947 and at the time of the communal riots in the state after the demolition of the Babri mosque in 1992 — without any adverse effects. “We have gone through all these phases in history. So I don’t think it would create major polarisation,” Bandyopadhyay concluded.